July is always a big month for gaming news, as publishers want to drum up hype for their upcoming releases for sale and demo at Gen Con in August. This year has proved no exception, with a ton of really interesting news that will excite fans of campaign and narrative gaming! 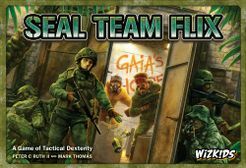 SEAL Team Flix is co-operative tactical dexterity game, a modern warfare “dungeon crawler” in which you flick disks to shoot enemies and perform other tasks. You know, another one of those. The game comes with a campaign mode with a branching mission structure (17 missions in the box, but you will only see 8 of them in a single campaign playthrough) that allows players to promote/level-up their characters from mission to mission. 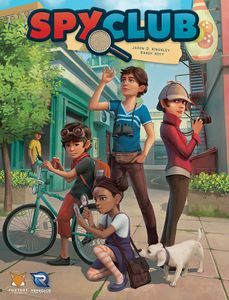 Spy Club is a family-friendly co-operative set collection game about kid detectives trying to solve a crime in their neighborhood. It can be played as a standalone game, but the main draw is it’s “mosaic” campaign mode. At the end of each of the first 4 games in the 5-game campaign, you unlock 1 of 40 mini gameplay modules that get added into the next game(s) of the campaign. You’ll only see a fraction of the game’s content in a single campaign, and would need to play probably at least 10 campaigns to experience all the hidden content! 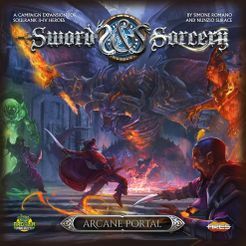 Sword & Sorcery: Arcane Portal is the first expansion to Sword & Sorcery, a co-operative fantasy adventure dungeon crawler. Arcane Portal comes with a 4-scenario campaign that continues where players left off in the base game’s campaign. The scenarios can be played standalone, but a copy of the Sword & Sorcery base game is required to play this expansion. Ryan Lauket of Red Raven Games added a new game to BGG’s database called Sleeping Gods, a 1-2 player atlas storybook campaign game. You play as the captain and crew of a steamship in the 1920’s exploring the seas and islands for 14 hidden totems of the gods so that you can return home. The game is played on an atlas where each page is a map, and moving off of one edge of a page will move you to another page of the atlas. Sounds very much like Near and Far meets The 7th Continent, so I am excited to hear more details about this game! It’s currently listed as a 2019 release on BGG. Speaking of storybook games, Plaid Hat Games announced Comanauts by Jerry Hawthorne, the second title in their Adventure Book series. Brilliant inventor Dr. Martin Strobal has fallen into a coma, and you must enter his mind and face his inner demons so that he can wake up and stop one of his own inventions from destroying the world. The game is played across a co-operative campaign of 11 unique dreamscapes ranging from the wild west to sci-fi based on the cover art. The rules and components make reference to stickers placed on certain cards in the campaign, but it’s not being described as a legacy game. 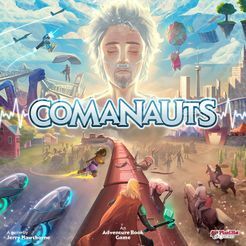 Comanauts is due to release in December with an MSRP of $69.95, and the rulebook is available for download now on Plaid Hat’s website. Plaid Hat Games is stepping up their game this year, as they also announced Gen7: A Crossroads Game, the long-awaited sci-fi Crossroads followup to Dead of Winter. Gen7 is described as a “grand narrative game with multiple possibilities.” Players take on the roles of officers aboard an international colony ship to a distant star system. Things have been going well for the first six generations of humanity that have lived on this ark, but you are of course “lucky” generation number 7! A terrible mystery has emerged that threatens the entire mission, and the fate of humanity rests on the choices you make. This game is a semi-cooperative game for 3-4 players where everybody is trying to be the best officer on the ship and look out for their own crew, but also must work together to ensure the success of the mission and humanity. The game is played across a 7-episode campaign with a wildly branching narrative. The product page lists that it has 9 sealed envelopes in it, it’s not described as a legacy game. Given that there is a major mystery plotline to it, it’s not clear at this point if it’s replayable or not. No release date has been given, but it’s available for pre-order with an MSRP of $99.95. The rulebook is available for download now on Plaid Hat’s website, and will be demo’ed at Gen Con. CMON Limited announced they will be launching a Kickstarter campaign for Trudvang Legends by Eric Lang, Guilherme Goulhart, and Fel Barros. 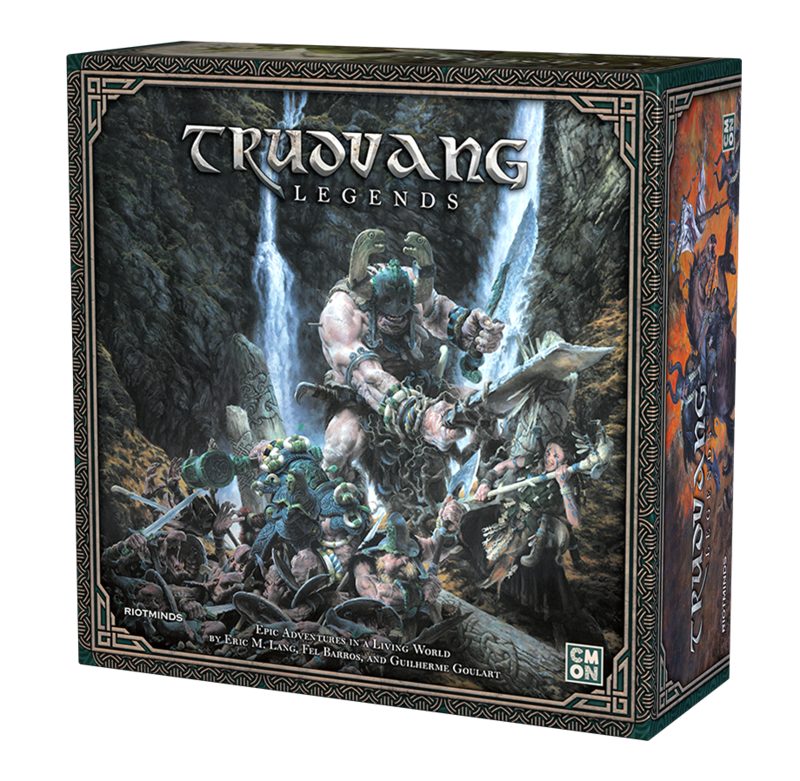 Trudvang Legends is a living world adventure book game based on the Trudvang Chronicles RPG, and is an epic saga told over the course of generations. Choices made by players will echo through future generations as well as the world itself. The press release refers to the board physically changing, but also says it’s infinitely replayable so it’s likely not permanent change. No details yet about whether this is a co-operative or competitive game. The Kickstarter is slated to launch in Q2 2019, likely a 2020 release. Mindclash finally added a BGG game entry and details about their next Kickstarter project, Perseverance: Castaway Chronicles. 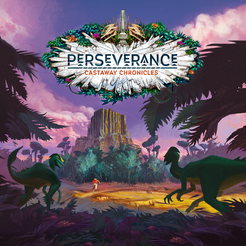 Perseverance is a dice-drafting / dice-placement euro game about a group of castaways building a city and exploring on a mysterious island with dinosaurs. The game is played across a 5-episode campaign with evolving mechanics. They are very clear that there are no legacy or hidden/sealed elements to the game, and can be replayed infinitely. The official player count is 2-4, but designers have mentioned there being a solo mode. It is listed as a 2020 release on BGG, and last I had heard it would hit Kickstarter in Q4 2018. Greenbrier Games teased in their July newsletter about an upcoming Kickstarter project for a “hybrid tabletop/app dark fantasy campaign set in a cartoon world.” It will be available for demo in the First Exposure Playtest Hall at Gen Con and Twist Gaming will do a preview of it 7/31 as part of their Twitch stream. No more information at this time, but it sounds promising! Vesuvius Media announced that they are working on Centauri Saga: Scorched Earth, aka Season 2 of their expansions for Centauri Saga. I presume this takes place after the events of the first expansion (which I haven’t played yet), Centauri Saga: Abandoned, and it looks like the fight against the aliens has come back to our solar system. No confirmation yet if this is a legacy expansion like Abandoned, but it was confirmed that nothing from Season 1 is required to play Season 2. Also sounds like this is part 2 of a planned trilogy. They aren’t planning to bring this to Kickstarter until Summer 2019, which would likely make it a 2020 release as well. Ares Games announced Sword & Sorcery: Ancient Chronicles, a new two-act cycle of games/expansions set it in the Sword & Sorcery universe, before the events of the Immortal Souls/Darkness Falls campaign. It sounds like it will be a standalone game and set of expansions, but they will provide crossover ability to swap in heroes and monsters from the first cycle. They will launch a Kickstarter campaign for it in Q4 2018, and will be releasing more information on their Facebook page throughout August and September leading up to it. 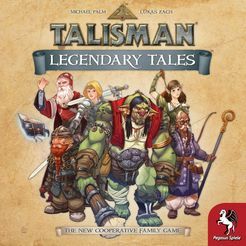 As part of their line of games set in the Talisman universe, Pegasus Spiele posted details on BGG about Talisman: Legendary Tales, a co-operative family-friendly adventure game. Players work together through a series of adventures to recover the five legendary Talismans that have been lost. Adventures must be played in a certain order to tell the story, but any other details about the campaign play are pretty scarce. A Talisman fansite really broke down all the details found on the back-of-the-box art. The game should be available for sale this week at Gen Con, where we should know more. Pegasus Spiele added a BGG entry for another title by Michael Palm and Lukas Zach, Adventure Island. There are no images of the game, and the only details to go on is the description. It’s a co-operative game where players are shipwrecked survivors on an island (hopefully without dinosaurs!). Players must work together to survive, explore the island, and eventually make their way home. The description implies the story is told across multiple play sessions, and that choices that players make influence the story and unlock new elements. They provide the standard disclaimer that the game is not a legacy game and is infinitely replayable. It’s supposedly going to be demo’ed at Gen Con this week, and is listed as a 2018 release, so likely an Essen 2018 release. Gloomhaven: Forgotten Circles, a “small” expansion containing a new character class and roughly 20 scenarios is taking a little longer than anticipated to finish developing, so they won’t be making an Essen release date. This is largely due to the fact that the scenarios in Forgotten Circles will be more complex than the typical “kill all the baddies” scenarios found in the base game. Scenarios will contain branching paths, “choose your own adventure” moments, puzzles, and alternate endings. It’s worth pointing out that the scenarios for Forgotten Circles are being designed by Marcel Cwertetschka, who wrote some of the side scenarios in the original game. Cephalofair Games hopes to have it for sale in December, possibly January due to holiday delays, and will be running a pre-sale (not through Kickstarter) for people that want to guarantee a copy in the first print run. Sign up for his mailing list to be notified! Isaac Childres is working on a much larger expansion for Gloomhaven, but anticipates it could be years before it is released. That gives you plenty of time to finish the 150+ scenarios spread across the core game, solo scenarios, Forgotten Circles, Into the Unknown, and Capital Intrigue! Rob Daviau was a keynote speaker at Dice Tower Con 2018, and was part of a number of panels regarding his past and upcoming titles. The Dice Tower was kind enough to film and host these videos on their YouTube channel. Rob gave a very in-depth preview of Betrayal Legacy in one talk, not spoiling anything about the game, primarily focusing just on the core mechanical differences between it and Betrayal at House on the Hill. It sounds like a lot of work went into unifying common terminology and information layouts for all of the scenarios, so there should be less rules ambiguities. Yay for good UX! Rob also hosted a Q&A panel on legacy games that JR Honeycutt sat in on the last half of as well. Rob mentions in the video that they are doing playtesting on Pandemic Legacy: Season 3 (Matt Leacock also had an open call for playtesters at Gen Con 2018, slots were quickly filled), and that Rob and JR are working on an original legacy game that is expected to release in 2019. Pandemic Legacy: Season 2 won a Sonderpries (“special prize”) at Spiel Des Jahres 2018. This is the first special award to be given out since they added additional award categories in 2011. Ten years after the release of the base game, the “Pandemic” family is growing larger. And how! Already with Season 1, Matt Leacock and Rob Daviau opened the gateway to a fascinating game world; with this perfect sequel they have topped even themselves. “Pandemic Legacy – Season 2”, the best version of “Pandemic” so far, is the yardstick against which all future legacy games must measure themselves. The jury would like to honour this extraordinary achievement by this designer duo with this special award. 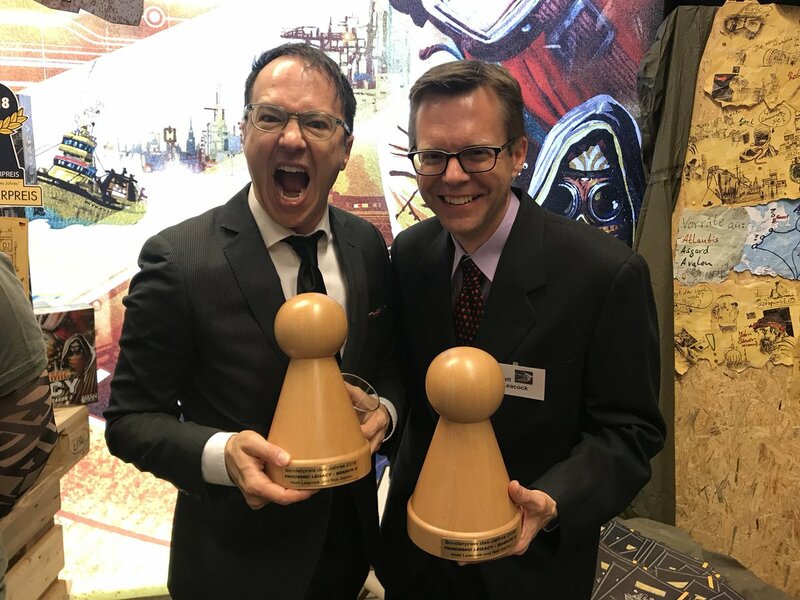 Pandemic Legacy: Season 2 is the fourth campaign/narrative game to be nominated for a Spiel des Jahres, and the second to win an award. Pandemic Legacy: Season 1 and T.I.M.E. Stories were nominated for Kennerspiel des Jahres in 2016 (both lost to Isle of Skye), and Legends of Andor won Spiel des Jahres in 2013. There was a pretty major Kickstarter scandal in July regarding a campaign for Overturn by Foxtale Games. Overturn: Rising Sands is (was?) a campaign-based co-operative adventure game set in a Middle Eastern fantasy setting, developed and designed by people from Pakistan. The game had initially gotten over $375,000 CAD in funding when it initially launched, as there seemed to be a lot of interesting in the setting, as well as the low price point for the amount of content offered in the core game. Backers slowly started to trickle out over the ongoing weeks due to lack of real gameplay details from the publisher/designer, and doubts that the publisher could deliver on what had been promised. When they finally posted an alpha rulebook, a backer was quick to realize that the rulebook at been largely plagiarized from Massive Darkness’s rulebook. This launched an internet vigilante mob that uncovered that several other details of the campaign and company were copy-pasted from other Kickstarter campaigns and company bios. The fox tale in their company logo is believed to have been stolen from the Mozilla Firefox logo. More details about the accusations can be found in this article. A lot of backers were quick to accuse Foxtale of being a scam, and unfortunately I think some of these accusations were motivated because the designers were from Pakistan. I would like to think that these guys were genuine in their desire to produce this game, but did not do the necessary prep work for a game and Kickstarter campaign of such scale, and cut a lot of corners that ultimately lost them the trust of their backers. At the end of the day, getting this project cancelled now probably saved a lot of backers and the creators a lot of headaches down the road. GEN CON 2018 THIS WEEK! Gen Con 2018 starts this week on August 2nd, and I fully expect there will still be a few more surprise announcements coming. Fantasy Flight Games is giving their In-Flight Report on Wednesday 8/1 at 7:00 PM EST, so expect to hear a number of new titles announced there. Maybe we’ll find out what this is about? I’m going to try to squeeze in a Top 5 To Try and Top 5 To Buy list for Gen Con before it starts, and will do a special post-Gen Con news wrap up next week.